Home BusinessFinance How Does Student Loan Consolidation Work? Student debt is a major problem for modern young adults. While loans may be a necessary evil in order to put yourself through college, the troubles they cause later on can be extreme. In many cases, the intense pressure and problems of excessive student debt can make a young person wonder if the education was even worth it. But whether this is the case or not, you will be forced to deal with the debt afterwards if you take out student loans. You may still be dealing with it while saving to put your kids through school, but there are options available that can help the process. Once such option is student loan consolidation, and this could provide an escape for those who see no way of realistically paying back student loans within a reasonable timeframe. As student debt is unlike other common forms of debt, so student loan consolidation is different than traditional debt relief programs. For those who need a way to overcome excessive credit card debt, medical bills, personal loans and other typical unsecured debts, consolidation offers a way to deal with all of the debt at once. Debt consolidation allows consumers to take out one large loan in order to pay back all of their current debts. Ideally, the new loan would have a significantly lower interest rate than current debts and stretch it out over a specific period, reducing the amount that must be paid each month and simplifying the process by only requiring one payment for all debts. When done responsibly and correctly, this can provide an invaluable tool that helps individuals achieve a level of financial stability. However, student loans are a unique form of debt that are governed by different laws, terms and regulations, and therefore the same methods cannot be used to deal with them. While consolidation is still a possibility with student loans, it is very different than the technique that is used with other common forms of debt. Student loan consolidation allows you to essentially roll all of your current student loans into one, which is similar to the process of traditional debt consolidation. But it is different in that student loan consolidation comes from the federal government, and it can only be used to pay student loans. The basic concept behind a Direct Consolidation Loan is that the Department of Education will pay all of your current student loans– or the specific loans that you designate as part of the consolidation– and allow you to make one monthly payment instead of several. The specifics of potential consolidation will vary according to the amount owed, number of loans, your income, loan status and other factors. Your geographic area is another important element of the loan, and you can research online what student loan consolidation rates are like in your state. 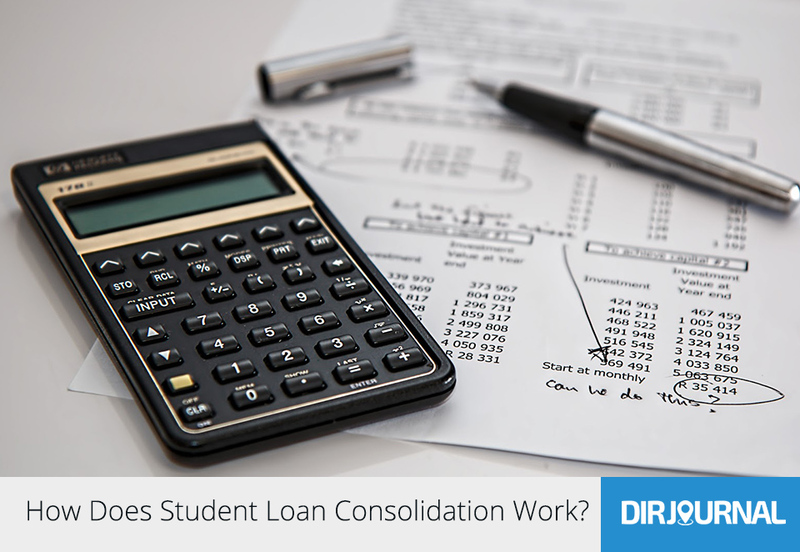 When looking at possible consolidation options, it is important not to confuse traditional (government) student loan consolidation with private student loan consolidation. Also known as student loan refinancing, private consolidation is different in that the funds come from a bank or other private institution instead of coming from the Department of Education. Both provide their own unique advantages and downsides, and it is important to thoroughly review all of your options before making a decision.